“Do you like helping Mr. Heuer with things like greeting visitors?” I asked the student who met me at the office of McFarland’s Indian Mound Middle School. Smiling to herself, she leaped into one big skip. “I love Mr. Heuer,” she said reverently and skipped again before opening the door to his classroom. Heuer’s class was busy getting ready to review for a social studies test by moving from station to station, arranging index cards expressing concepts from their studies into a connected story. 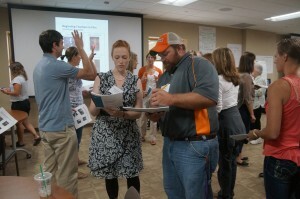 “It’s one of my favorite activities–I got it from colleagues,” said Heuer. Marc Heuer’s entire teaching career has been with the McFarland School District; he became a mentor about 15 years ago. During mentor training, Heuer realized that what he was learning to guide effective, respectful communication with adults worked with his students as well. “Becoming a mentor has been a revitalization of my career,” he said. 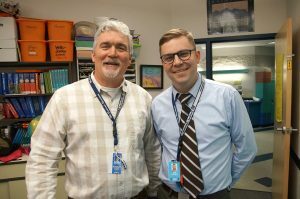 One of the hallmarks of Heuer’s teaching practice is to try and spend 30 seconds a day with every student, something his cooperating teacher recommended that he’s been doing ever since. It could be a quick exchange during silent reading, or a more formal conference. 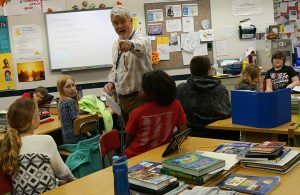 With his mentoring work, plus committee and team teaching responsibilities, Heuer says “It’s important to work in front of the kids the way we want them to work together.” He thinks keeping that in mind helps kids feel included and vested in the success—or failure—of classroom activities.